IK Multimedia has updated its popular iOS amp sim app AmpliTube to version 3.0, adding a number of significant additions focussed around AmpliTube Studio - a DAW-style recording and editing tool built into the application. 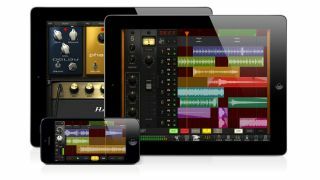 Available as an in-app purchase, AmpliTube Studio expands the app's single track recorder into a multi-track recording and editing space (featuring four tracks on iPhone/iPod touch and eight on iPad.) Audio can be sequenced, cropped, sliced and normalized, and fades can be added to the start and end of any clip. The Studio space also features a mixer section including send and master effects along with track EQ. Version 3.0 also adds a collection of new metal-centric amp and effect models that are available exclusively to users of IK's iRig HD interface. AmpliTube 3.0 is available now from the App Store, as a free update for previous users or as a free or paid app for iPhone/iPod touch or iPad for $19.99/€17.99 for new users. The Studio feature is available as in-app purchase for $9.99/€8.99 on iPhone and iPod touch and $14.99/€13.99 on iPad for users who have already purchased the multi-track recorder, or as a bundle that also includes the multi-track recorder.